Apple is still working on OS X 10.9, which it has named Mavericks. The software team earlier this week released the second beta version of Mavericks to developers. So, like with iOS 7, I’m going to dive in and show you the smaller, less noticeable changes that Apple didn’t highlight during the software’s introduction earlier this month at WWDC, but that are important for usability. As with any beta software, the new stuff is subject to change before the final release later this year. With that said, let’s dive in. 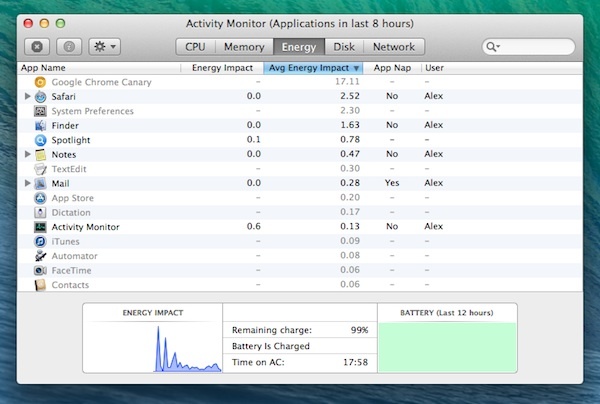 The battery drop-down in the menu bar will tell you which apps are using significant power. There’s a new lighter style for the two-dimensional side Dock that’s been with us since Leopard. It’s reminiscent of the Tiger Dock, but more toned down: it’s less translucent and the activity indicators are similar to those in the modern 3D Dock. Offline dictation is supported with a one-time download. Dictation can also write what you’re saying as you speak, so you don’t need to click Done. Automator and AppleScript Editor can now use iCloud. iMessage has a redesigned login screen. Its preferences have also been updated, and the Alerts tab excised. The Messages tab has been touched up and renamed Viewing. Dashboard has a new background that’s just a simple, gray grid. The widgets still look the same, though. 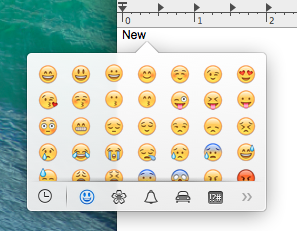 Mavericks has a redesigned character viewer that uses an inline popover design rather than a top-floating window. The keyboard shortcut to open the character viewer is different too (Ctrl-Cmd-Space instead of Opt-Cmd-T). You can search just by typing, and the old character viewer is still accessible from a button (which is only visible when searching). The image-picking popover (the one you get when changing your account picture) lets you choose an image from Photo Stream or from your Faces collection in iPhoto. The share widget in Notification Center now has an iMessage option, so you can make a new message quicker. 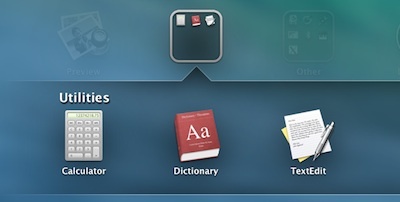 In Launchpad, folders no longer use the linen texture, but a slightly darker translucency than Launchpad’s default. Apps that are newly downloaded will also have a sparkling animation over them. Mail reverted back to displaying replies within nested, colored lines instead of in their own cards. This takes up less space, but you can’t drag messages around like you could before. Update: You can go back to the cards by checking off “Organize by Conversation” in the View menu, though. In Mission Control, you can drag a fullscreen app to the left of the first desktop. You can also re-assign the first desktop by dragging another desktop past it. The dropdown menu for Versions has been simplified and changed into a popover. You can edit tags now, and it takes fewer steps to rename or move a file. The options to duplicate a file and browse its previous versions are gone, however. There are two new sections in the Accessibility pane’s sidebar: Captions and Switch Control. Captions lets you set the style for system captions. Switch Control lets you control Mavericks with generic switches, such as a video game controller. 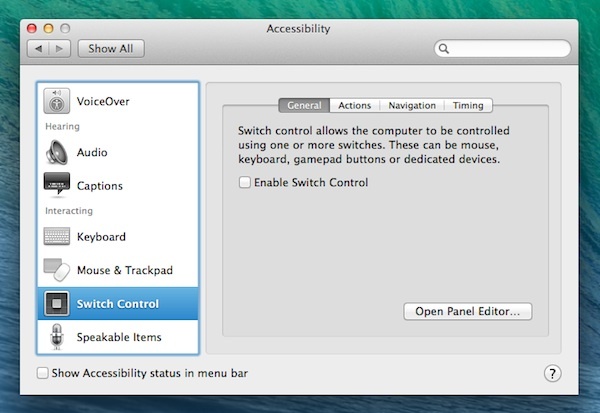 This is a nice new accessibility feature and possibly opens the door to official game controller support in OS X, since we already know it’s headed to iOS. Options for Do Not Disturb have been added to the Notifications pane. The Text and Input Sources tabs have been moved from the Language and Text pane to the Keyboard pane. The Input Sources tab has also been redesigned and now shows a preview of the keyboard layout for a selected langauge. The categories like Hardware and Personal are gone, and the icons are slightly bigger. The option to disable font smoothing for fonts past a certain size is gone from the bottom of the General pane. You can double-click a folder while holding the command key to open it in a new tab. The default folders in the sidebar now exclude pictures, movies and music. The gray border around currently selected files is slightly darker. The tabs have been moved to the toolbar, and the bottom panel has been redesigned. A new Energy tab has been added that shows you the energy impact of your apps as well as their App Nap state. The Disk Activity and Disk Usage tabs have been consolidated into a single Disk tab. Starting with OS X Mountain Lion, the trend for Apple’s annual OS X releases has been on fewer big changes and more refinement. Mavericks’s big things are the iBooks and Maps apps, power efficiency features like App Nap and Timer Coalescing, and an aesthetic shift away from skeuomorphism and textures (so long, linen). The refinements are mostly about usability, like the offline dictation mode, the redesigned Versions menu and the new accessibility features. So far, Mavericks is shaping up to be a great release, and I can’t wait for the final version to hit the App Store some time in the fall. Is it still possible to have a minimalist Finder, where you hide the toolbar and sidebar, viewing folders as simple white squares? Can you still Duplicate using the Shift-Cmd-S shortcut? Tabs are now animated (that is, they slide slowly instead of doing it instantly). Applies to both Safari and Finder. That is, Mavericks introduces yet another annoying animated distraction. By any chance, does anyone know is there any way to disable it? Firefox lets users disable it – and hope Mavericks does too. Command-double clicking a folder in Finder opens it up in a new window now in ML and I’m pretty sure it did in previous versions as well. This is the kind of refinement update I wanted in iOS 7, rather than a Vista-type reboot. Great that offline dictation is available. I sometimes like to read some text from a book aloud into a document I’m editing (since OCR of printed text is a hassle, for short excerpts it can be easier to read it and have the dictation convert it to digital). I wonder if the offline dictation is capable of improving (learning the voice of the users)? Or, I wonder if the offline dictation has itself been able to learn from the multitudes of people who have used it so far with Apple’s cloud (in other words, is offline dictation a beneficiary of the online dictation crowd sourcing thus far)? You scared me with the nested/colored lines vs. cards in Mail — that’s my favorite feature in Mail and I’d absolutely hate to lose it. But it’s working as before on my MBP. Maybe you just don’t have the View Conversations setting turned on? Yep, I didn’t notice the View settings. The card view was off by default. “Mail reverted back to displaying replies within nested, colored lines instead of in their own cards.” is there an option to keep the cards? i quite like this view. Yes there is, actually. In the View menu there’s an option to organize by conversation. Thanks for asking. I didn’t think about that. Agreed. This is the sole reason I use Mail instead of Outlook.